Ada pertanyaan untuk Yufuin Onsen Kishokaiuntei Muzinzo? Baik Anda turis maupun dalam perjalanan bisnis, Yufuin Onsen Kishokaiuntei Muzinzo adalah pilihan akomodasi yang tepat ketika mengunjungi Yufu. Dari sini, para tamu dapat menikmati akses mudah ke semua hal yang dapat ditemukan di sebuah kota yang aktif ini. Dengan lokasinya yang strategis, hotel ini menawarkan akses mudah ke destinasi yang wajib dikunjungi di kota ini. Yufuin Onsen Kishokaiuntei Muzinzo juga menawarkan berbagai fasilitas untuk memaksimalkan pengalaman menginap Anda di Yufu. Ada beberapa fasilitas hotel ini seperti WiFi gratis di semua kamar, tempat pengisian listrik untuk mobil, layanan kebersihan harian, perapian, layanan pos. 4 kamar yang tersebar di 1 lantai memberikan suasana hangat dan menyenangkan ketika Anda jauh dari rumah. Kenyamanan modern seperti handuk, sandal, televisi layar datar, akses internet WiFi (gratis), AC dapat di temukan di beberapa kamar. Hotel ini menyediakan sejumlah fasilitas rekreasi seperti pemandian air panas, pijat. Ketika Anda mencari penginapan yang nyaman di Yufu, jadikanlah Yufuin Onsen Kishokaiuntei Muzinzo rumah Anda ketika Anda berlibur. Tamu yang memiliki alergi terhadap makanan tertentu atau memiliki preferensi makanan tertentu disarankan untuk memberitahukan pihak properti terlebih dahulu melalui kotak Permintaan Khusus. Para tamu diwajibkan untuk menyediakan informasi perkiraan waktu check-in di properti sebelum kedatangan. Semua tamu diwajibkan untuk memberitahu pihak properti perihal jenis kelamin dari para tamu yang menginap sehingga perlengkapan kamar dapat dipersiapkan. Silakan menghubungi properti paling lambat 2 hari sebelum kedatangan. Tamu yang memesan kamar dengan makan malam wajib melakukan check-in sebelum pukul 18:00. Apabila tidak, maka makan malam tidak dapat disajikan dan tidak ada pengembalian uang. Anak berusia 4 hingga 6 tahun akan dikenakan biaya untuk makanan anak. Sarapan disajikan mulai pukul 08:30.
three doors seperated the room into three space so the size of the room was so big for 1 person. Private onsen bath in my room was the best point of here. Its size was enough for 2 people and it has a window so that I could see mountain view in bath. Room was so clean and useful amenity was equipped well. I want to visit here again someday. Facility is great! But hardly to find the location. Google map shows the wrong direction. Our group had some difficulty fond the hotel since the hotel sign is quite small. The staffs was very nice and helpful. 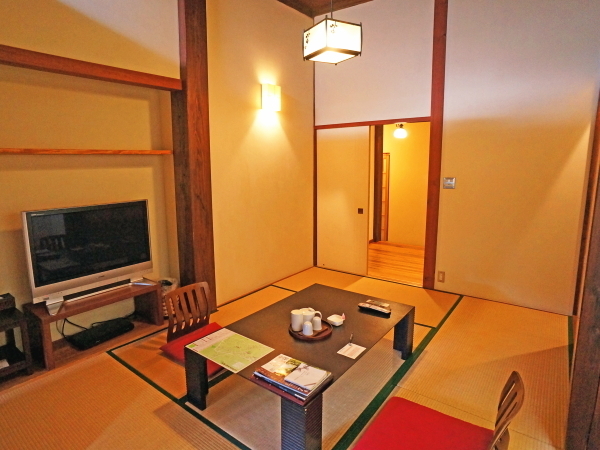 The room was clean and comfort since we have our private onsen in the room. 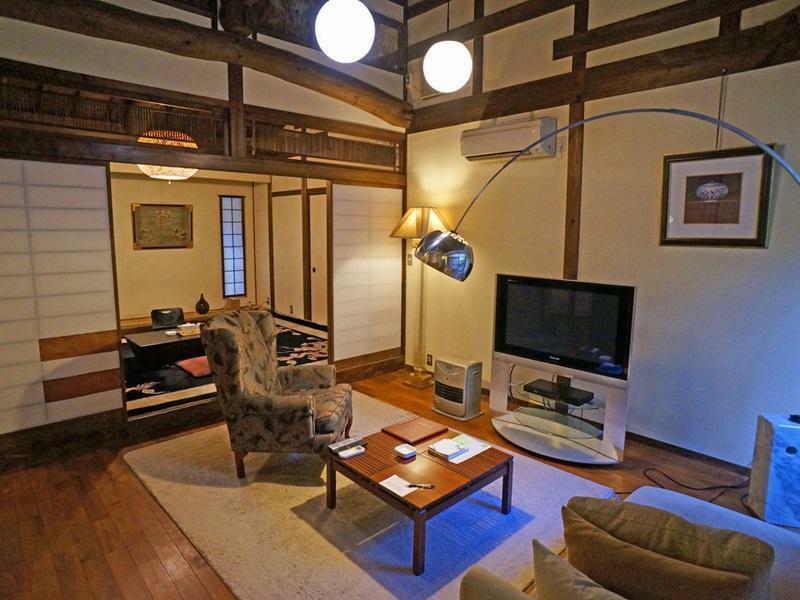 The hotel is located on the Yufuin walking street which very convenient. As a sightseeing tourist, need early breakfast to catch train . It's a pity that not accepted to have breakfast at 7:45. Or even 8:00 morning at the beginning. Although accepted 8:00 lastly but this not customer friendly especially a rush breakfast and raining days rush to jr station after breakfast. May be different culture, but for me , hotel breakfast start at 7:00 is normal time. So I cannot put it as a 4 star service. Also no bottle water refill even stay two days Food is good, clean room and prefect have private onsen in room. Still recommend as a good hotel but would need not to catch early train in journey. - room facilities a bit old, e.g. some dirt spots on carpet - overall cleaningness is good - convenient location - free parking spot was far away from hotel Overall satisfied; a happy stay! Very Nice!! Extra Ordinary. Excellent service and dinner. Not a cheap one, but reasonable to pay. All the shops close very early in that town, so make sure you will arrive there before 18:00 Nice interior, great facilities! 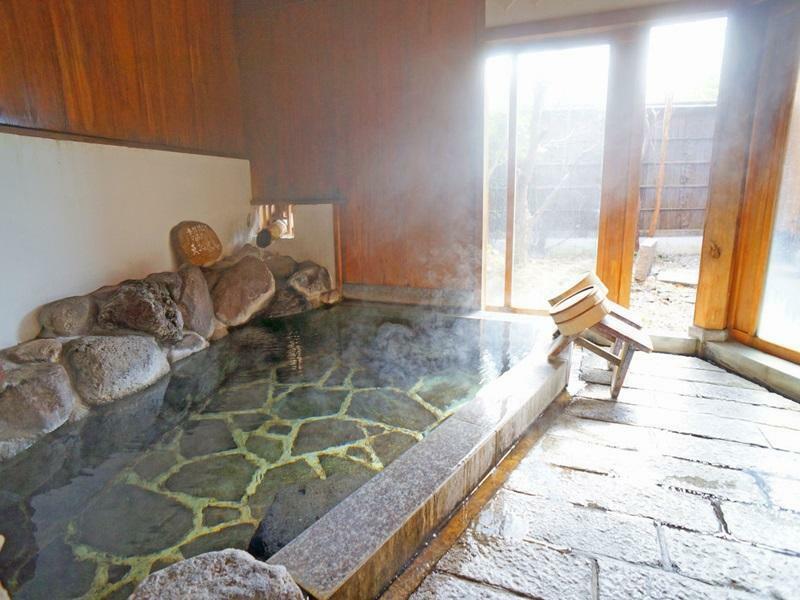 can enjoy Onsen every mins if you love Onsen, don't miss it! Close to the KinLin Lake! not very close to the JR station, but that is fine, just walk around 15mins with nice view. 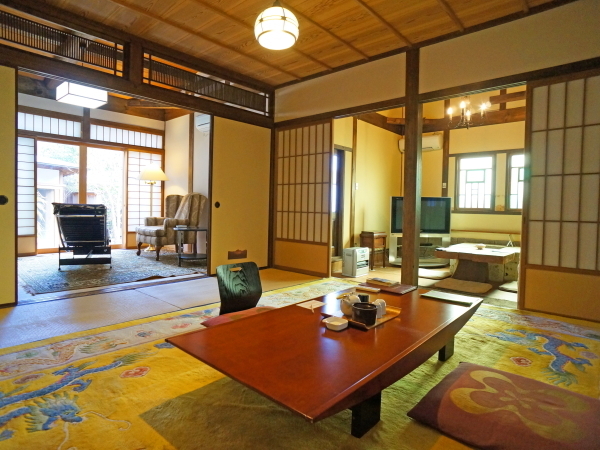 room is clean and neat with japanese dadami style. 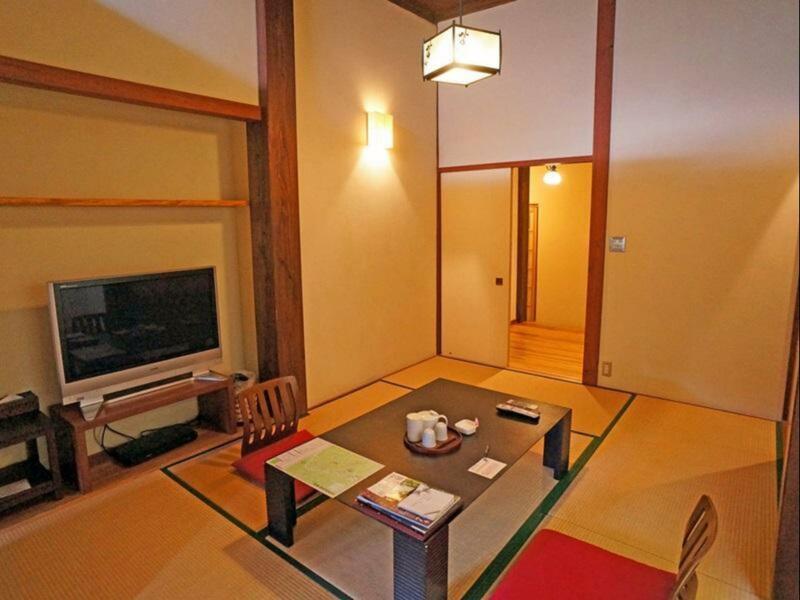 each room has private bath space with hot spring water. dinner and breakfast are good. But in winter time, room is not so much heated and water does not come out due to snow fall and cold weather (pipe frozen) so not recommend to stay in winter time. Location of the ryokan is good but the entrance is not so easy to be found, it is at the left side of two western restaurant. 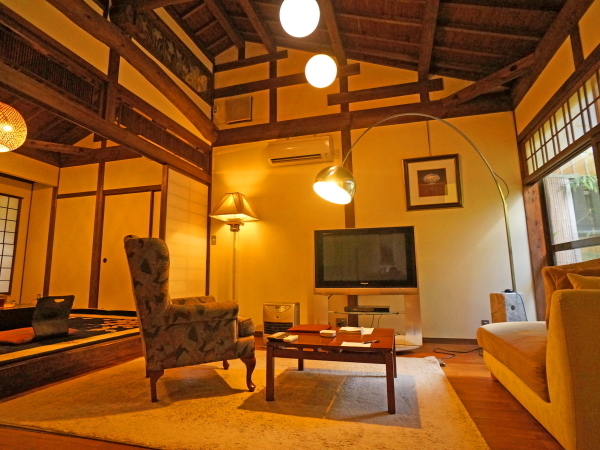 Only four rooms are provided but room size is super big, with air-con, LCD TV, private hot-spring pool but no WIFI provided. Western or Japanese style of dinner provided, staff will ask when and what style for dinner prefer. We take Japanese style dinner, staff lead us to a private room to enjoy the beautiful food. Staffs present each course of food, they will give an introduction of it, although we cannot fully understand, but we can feel their enthusiasm. The service standard was a real let down. None of the staff offered to help with my luggage when i checked in and to top it off, i'd to discover cigarette butts in the room's ashtray wasn't cleared prior to our check-in! The real plus was that it was just slightly off the main shopping street and was really convenient. But this means that we don't get any view from our private onsen. 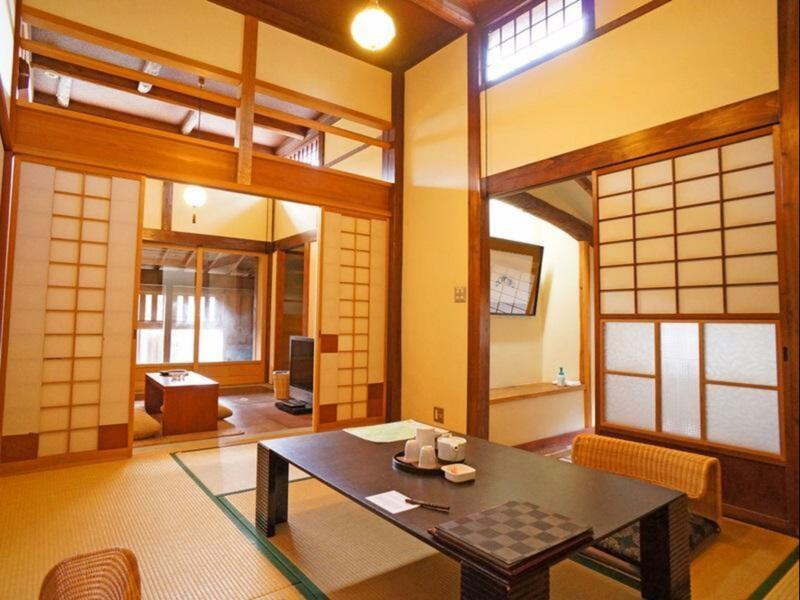 The private onsen in the room was a gem and if not for it, you are better off eleswhere! Overall, a pleasamt stay less the dip in the service standards! Very nice and comfort Japanese style hotel, limited rooms with good service, room with private onsen was so relax, breakfast is good and yummy, hotel is locate in the main street of 湯之坪 but should be careful cause the entrance is not obviously, just beside a restaurant and follow with a path (no signal and no hotel name showed nearby). Overall, that was a nice stay and we enjoy the time staying there. The dinner and breakfast is very delicious! Room was big, nice and comfortable. Welcome drinks and snack was offered. Service is good but no people in the front desk at night. Telephone for emergency was given (but how can I find them if I only had wifi or if I can't speak Japanese?!). 20mins walk from JR station. Recommend to check in before sunset because the entrance is in the alley and is inconspicuous. If you walk along from the JR station, you will see a big walk sticker of pizza before turning right to the alley.